The church originated as a mission church of 1896 in the now defunct parish of St John the Baptist. This was soon considered ‘inadequate’ (CDG 171 (1908) p46) and the foundation stone for a permanent church was laid in 1908; the architect was G H F Prynne (B 95 p 141). The chancel, transepts and three bays of the nave were ready by 1910, with the intention of adding in due course the remaining three bays and a tower which was to have been on the western side of the north transept and to have had a copper spire (ibid). However, nothing more was done and only a stump shows its intended position, beneath a temporary belfry. 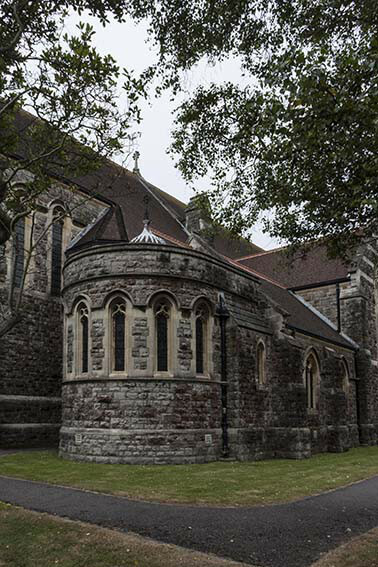 St Wilfrid is built in a freely interpreted version of Perpendicular, faced externally in rough finished grey stone, contrasted with bands of smooth masonry, though an early elevation by the architect shows brick was intended (church website). The chancel is as high as the nave; the chancel arch barely obtrudes, save as an interruption of the boarded roof and a low, arcaded wall is the most conspicuous division. 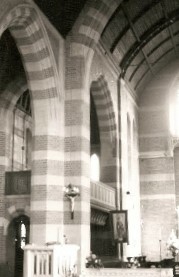 The interior is faced with contrasting bands of red and yellow brick and is spacious, even in its truncated state.One sign of the date is the side-galleries in the chancel. The aisles are low, but the arcades are kept in proportion by placing them in tall wall-arches that rise to the full height of the walls, thus enclosing the clerestory windows, which are lengthened with panelling below the sills. The arches to the transepts are similar and there is an apsidal north chapel with closely set traceried lancets. 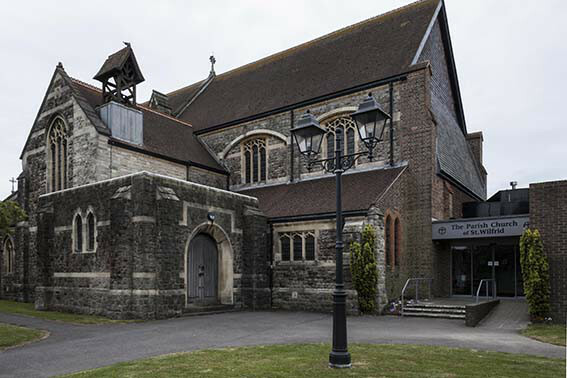 Immediately to the west of the church, a brick hall was built in 1972, linked to it by a low vestibule and ensuring by its position that the nave can never be completed. Arms: (West wall) Charles Manners Archbishop of Canterbury who consectrated the original church of St John the Baptist in 1822. These were moved first to the new church and then here in 1971-72. (1 p9). 1. (North chancel, first and second windows) P Bacon Brothers, before 1930 (www.stainedglassrecords.org). 2. (North chapel apse) P Bacon, eight saints, before 1930 (ibid). 3. (South transept, south window, C E Welstead, 1960 (ibid). 2. (North chapel) Edmond Gabbett (d1914 on war service), designed by M Gill (1 p28). Pulpit: Stone with pierced traceried sides. Reredos: (removed here from St John the Baptist, London Road after 1971) War memorial by F E Howard, 1919 (1 p20 – as ‘F G Howard’). It consists of separate carved panels. The centre one was changed by the same artist in 1934 from the Transfiguration to the Resurrection (ibid p37). Statue: (West end) Christ Ascendant by U Nimptsch, 1964, bronze and over life-size. This was originally placed on the east wall and was moved first into the south transept in 1977 to allow sufficient space for the installation of the reredos (ibid) and more recently to its present position. My thanks to Nick Wiseman for the photographs of the exterior and the engraved glass. I am sorry about the lack of colour photographs of the interior in accordance with the wishes of the present incumbent.